HollywoodLife.com was launched in the year 2009 and it has managed to become one of the top online guides for women between the ages 18 – 34 within a very short time. The website is famous for covering the latest on subjects of fashion, celebrities, entertainment, beauty, skin care and baby news. The website has literally managed to attract record breaking traffic on a monthly basis and it can be accredited with exciting and emotional content that can instantly connect to the site’s female audience. HollywoodLife.com isn’t just about reporting the latest scoops, it is also about offering greater insights into the personal lives of your favorite celebrities. It allows you to identify with their achievements, trials, diversions, practices, ideologies, beliefs, obsessions and romances. Moreover, HollywoodLife.com also showcases live coverage of pop culture events as well award shows to help keep things interesting. In an article titled “Demi Lovato’s Flawless Skin Secrets – Her Exact Skincare Regimen Revealed”, HollywoodLife.com talks about celebrity singer and X-factor judge Demi Lovato’s post on Twitter in which she shared insights about the skin care products that she uses to make her skin look flawless and beautiful. 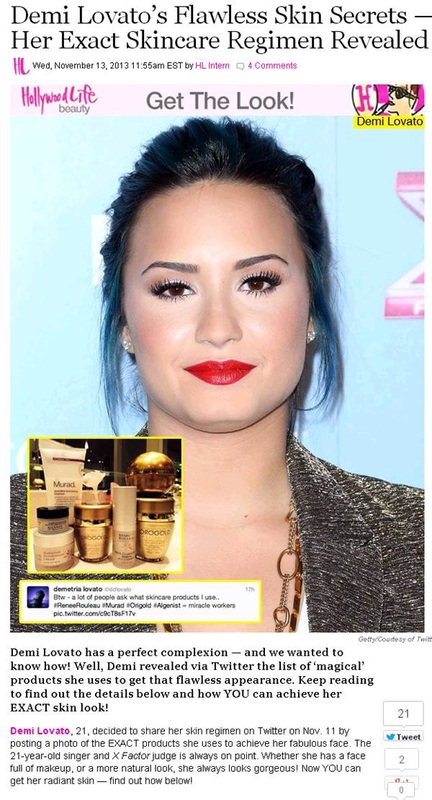 The article states that Demi uses the OROGOLD 24K Deep Peeling to get clear skin. HollywoodLife.com also reviews the product by stating that this product “takes a layer of dry cells off the face to reveal smoother and younger looking skin”. 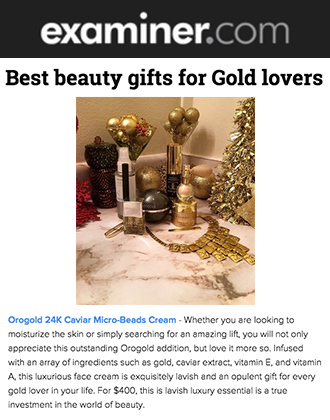 The article further mentions that Demi uses the OROGOLD 24K Multi-Vitamin Day Moisturizer and the 24K Multi-Vitamin Night Nourishment. OROGOLD is highly grateful to Demi Lovato for sharing her love for our products on her Twitter account and to HollywoodLife.com for reporting the same to its viewers. I first tried Orogold when I got their Thermal Mask and instantly fell in love. Orogold products are amazing!! love to have the skin that she have!! Can’t wait to try this luxurious product from Orogold!! Time to kiss these fine lines and wrinkles goodbye!! Thanks Orogold!!! I like the deep peeling maskand I love that the product last so long. Thanks for giving me hope for better skin. i love orogold so much it works like magic and leaves my skin looking radiant! I love this product! It discovered me while on vacation in AZ! We’ve been inseparable ever since! Love! this stuff works super well, and also great on sun burns! though something specialized would be nice. Demi has beautiful skin. Thanks for sharing one of her secrets! I like that she uses products from several different lines – it makes me believe she really uses them, rather than just promoting one set of products. Demi gas a great complection. Every women wants a great complection. I know orogold is top notch! My daughter and I love the orogold products mostly my daughter because she has eczema and these are the only products that do not irritate her skin and they work really well for both her and I. Best moisturizer on the market. It will make your skin feel like silk after one use. I love it. Demi has beautiful skin. I’d love to have skin like hers. I have a friend that purchased OROGOLD and she gave me a weeks supply to try. It sure helped my face and wished I had more. My skin is so dry even in summer and the product sure made my skin soft. Thanks for the giveaway. Great product – feels amazing! I am not at all surprised she uses Orogold. Your products absolutely lead to fabulous skin! Noticed a huge difference in my skin after using the orogold moisturizer I got in my glossy box! Not surprised Demi uses orogold. Her skin looks amazing! She has beautiful skin.Now I know why! I have wanted to try Orogold Cosmetics for so long! I live in Louisiana where the heat is so unbearable, you don’t even want to leave home. But, you have to, and with Orogold’s 24K Deep Day Moisturizer, I think my skin would love me again! New customer and loving it! 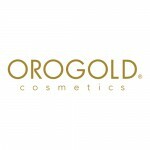 I love orogold products! With this moisturizer my face will look radiant and fine lines will be a thing of the past! I would love to use this on my face. A woman needs to look young as long as she can. My wife likes these products! I have never tried this before but have heard many great things. This is great for your complexion, Demi Lovato looks amazing! My old face sure could use some of this decadent face cream. I am using 24K Collagen Renewal Cream and I adore it! I love feeling pampered with these creams. They are soft and velvety. My skin has improved in texture after only a few weeks. Love these products! They are the best! So far I have the exfoliating gel, the vitamin c cleanser, & the moisturizer. Every girl needs OROGOLD 24K Deep Peeling! Her skin is beautiful 🙂 this product really works wonders! LOVE Orogold products! Have been using them for 3 months and can’t wait to try more! 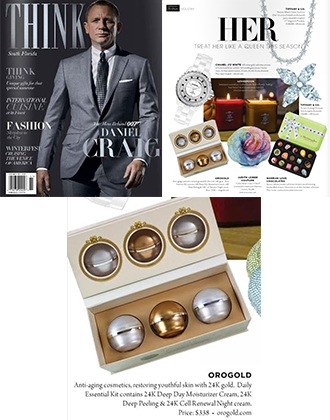 The Orogold products sound amazing, I’m sure a lot of people in Hollywood use Orogold products. Thank you for sharing this post. Your products mention in this article seem to peak one’s interest in trying them. I love the way Demi’s Face just had a healthy glow to it. Would not mind trying your Deep Peel and moisturizer myself! orogold is so lovey products!!! I never been know before meet orogold but when I used only one time, I feel orogold attractive. I love Orogold’s products and Demi. I am new to Orogold and am loving my first purchase- the deep peeling! Demi skin has always looks healthy and it glows! I have always admired how great her skin looks and now I know her secret! I am not surprised because I have been reading about Orogold for awhile now, only recently have I seen a more public appearances, and I have truly known I have to have it. I am a very logical person and reading how and why Orogold is made and how it works appears the most natural. I want my skin to look and feel great and if I can use Orogold I know it would! Thank You Orogold for the chance! I love my radiant skin after caring for it using orogold’s deep peeling treatment. I’ve seen “mooncake” that contains 24k gold. This is the first time I’ve seen a skincare line that contains 24K. If I can afford it, I would try them all. I picked up samples of the serum and moisturizer at the mall shop in Tampa! I love how my skin feels all day! Will be purchasing the products this weekend! Demi’s skin is enviable! 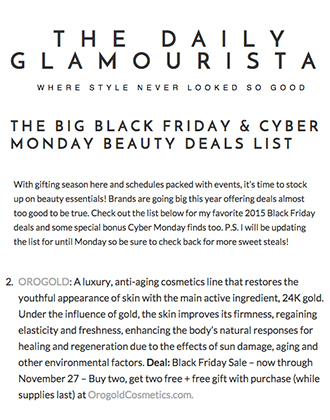 Orogold cosmetics are definitely on my short list of beauty desires! I use this brand daily and my face has never been softer!!! I love that it’s a deep moisturizer for use during the daytime. One usually sees only nighttime “deep” moisturizers. It’s always fun when celebrities reveal their beauty secrets! I was given a sample several weeks ago and really liked it. Gradually changing what I use to the complete Orogold line. Love the smell of the moisturizer. I really want my son to try Orogold’s products. My girlfriend just bought me Orogold… And I love it! I enjoyed a wonderful mini treatment at the East Hampton Orogold store. Michael and Rachel were very interested in helping me learn about the products…I loved the results! I believe Orogold products are really great! I would love to do the experince with such a great brand. I ve never tested Orogold but can t wait to do it! The Orogold products are amazing! I use the Termica, Caviar, Nano, and Cleopatra collections as well as some of the basic, Vitamin C, and Bio Brightening products. I also use the Body Butter which is great and smells so fabulous! Begin with one product and see how quickly your production collection grows! The peel, moisturizer and night treatment sound fantastic. Great review and this really makes me want to try it. I found the article about Demi Lovato using Orogold products very interesting. I just discovered your anti-aging skincare products. I would love to try them. Orogold really has amazing products which help my skin to stay glowing even when I don’t have a good day. Simply exquisite! Awesomeness to the highest level. I love love love the feel of the product on the skin. I love the smell, which is heavenly. I cannot wait to try the product out. I used the sample and it was too good to be true. Amazing product. Good job Orogold! I want to glow like Demi!! Just purchased my first OROGOLD product yesterday and I am eager to see my results. I bought the 24K Deep Peeling product. I was sold once I saw the demo! 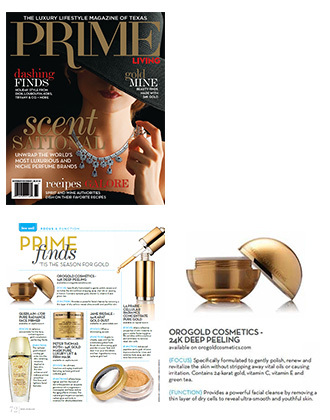 Love, love, love the 24K Deep Peeling Mask! Makes my face as smooth as a baby’s bottom! This sounds like a great product. I could really use some moisturizing on my skin. I have never tried Orogold, but I like the comment made by Demi that it would peel a layer of dry skin off your face leaving it smooth, it that is true then I would dearly love to give Orogold a try. If Orogold can possibly give me skin like Demi Lovado, I WANT some! I’m not surprised that Demi and I have the same taste in skincare, since we’re both the same age! But I have to say, she’s missing out by not also using the Orogold moisturizer. It’s the only moisturizer I’ve ever used that doesn’t end up feeling greasy on me. I love it! I personally use the Orogold 24K Deep Peeling and I can tell you that it is the best peel I’ve ever tried. I’ve used a ton of other brands, from drugstore and department store to salon and even doctor’s office brands. This product exceeded all my expectations. It really takes off that layer of dead skin cells and leaves my skin soft and glowing. I’m in my mid fifties and am battling aging as well as all the sun damage I caused from too much careless tanning in my youth. I think Deep Peeling is helping. The high quality ingredients really make the difference. Try Orogold. It’s well worth the money and the product goes a long way. I would really like to try Orogold’s moisturizer! If it’s not too pricey, I might be able to be some of this 24K Gold. I have heard about 24K Gold put out by Orogold! I WOULD LOVE TO TRY THE PRODUCTS.. I NOW HAVE THE EYE CREAM..
Im very excited to try this!!! This would be so nice to have a good complexion.